Abundant and familiar, the mourning dove is one of the most common backyard birds in the United States and is a member of the Columbidae bird family with other doves and pigeons. While these birds are a protected native species in North America, many states allow regulated harvesting of mourning doves as game birds. What other mourning dove facts may surprise you? These doves are easily identified by their long, tapered tails, soft gray plumage, and spots on the wings. Birders should know more of these birds' distinct traits, however, to be confident in telling mourning doves apart from other doves that look similar. Males and females are similar with overall beige-gray plumage slightly darker on the wings and tail with paler whitish-gray undertail coverts. A gray or faint pink wash can be seen on the head, neck, and chest in good light, and mature birds have a black cheek spot that may be difficult to see depending on posture and angle. Round black spots are prominent on the wings. The tail is very long and pointed, edged with white on the outer feathers. Males have an iridescent neck patch and both genders have a pale blue-gray eye ring. The bill is black and curves slightly down at the tip, while the gape can seem prominent even on adults. The legs and feet are red. Juveniles look similar to adults but often have a scaly appearance because their feathers have thin buff or whitish edges. Young birds also show a paler face and their feet and legs are not as brightly colored. The mourning dove gets its name from its low, mournful “ooo-Ahhh crooo-ooo-ooo” call, though other calls include a low, rapid coo when in distress and a rapid, high wing whistle when the birds take flight. These birds are often mistakenly called "morning doves" but will call throughout the day, not just in the morning hours. Mourning doves are common birds in the United States and southern Canada throughout the year. Their preferred habitats include open forest and farmland, but mourning doves are easily adaptable to suburban areas and parks as well. These birds are especially fond of open gravel or dirt areas for sunning and roosting. 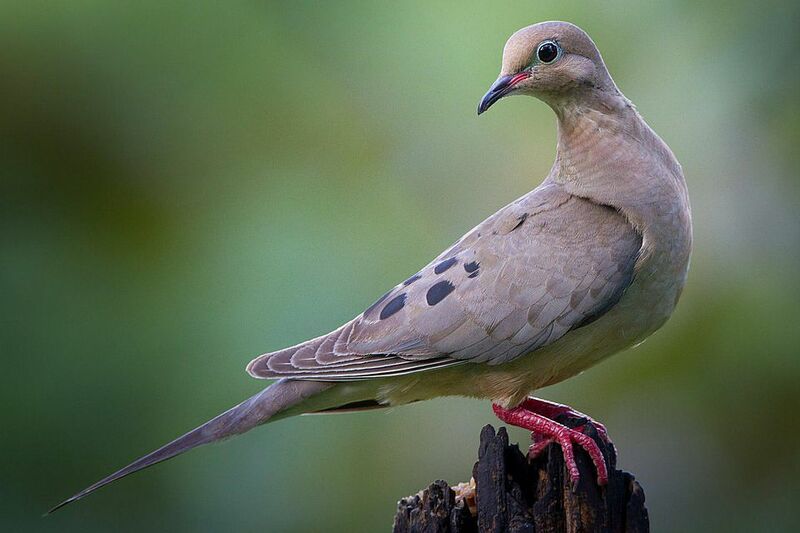 Very northern mourning dove populations may migrate as far as the Yucatan Peninsula or Central America in winter. If food is abundant, however, these birds may not migrate. Particularly in urban and suburban areas, mourning doves are often year-round residents even in northern regions. Male mourning doves can be very aggressive when defending their territory and will puff up their necks and hop in pursuit of other birds on the ground. This behavior is especially common during the breeding season when males are competing for the attention of females, and a male may pursue his chosen female just as aggressively as he might chase a rival. Around humans, these birds are often wary and may spook easily, which can lead to inadvertent window collisions. They frequently congregate in medium to large flocks, particularly after the nesting season when family groups may combine. Mourning doves also enjoy sunning and may stretch out one or both wings or fan their tails to soak up the sun's rays. Like all doves, mourning doves are primarily granivorous and eat mostly seeds and grain. They will, however, eat more insects and mollusks, including snails, during the breeding season when growing chicks need greater amounts of protein for proper development. They will frequently feed on the ground under feeders, cleaning up whatever seeds have been spilled by other visitors. Mourning doves are monogamous birds that may mate for life. Their nests are relatively clumsy, bulky piles of twigs or small sticks and grasses, built by the female partner. Nests may be positioned 5-50 feet above the ground, and are occasionally placed in odd locations, such as in hanging flowerpots or on sheltered windowsills. One dove pair will produce from 2-6 broods per year depending on the climate and available food sources, though each brood only contains two plain white eggs. Both parents incubate the eggs for 14 days, and both feed the newly-hatched chicks regurgitated crop milk and seeds for 12-14 days until the young birds are ready to leave the nest. Because these doves are not considered threatened or endangered, and because they are highly adaptable, there is no concern over their conservation. They can be threatened by outdoor pets, particularly cats, however, and are often victims of window collisions. Those threats should be addressed, not just to protect mourning doves, but for the conservation of all birds. These pigeon-like birds readily visit feeders where seeds such as millet, cracked corn, and milo are available. They prefer platform or ground feeders, as well as ground bird baths, and birders can take advantage of other techniques to attract doves to bring mourning doves to their yard. On the other hand, many birders may consider mourning doves to be nuisance or bully birds because of their voracious appetites and the larger flocks they form in late summer and fall. To discourage these birds, avoid platform and ground feeders and offer foods such as nyjer seed and suet instead, or take other steps commonly used to discourage pigeons. Mourning doves are easy to find within their range, but they can be skittish and may flee quickly if approached or startled. Their distinctive wing whistling, however, can still help birders identify these birds even with only a quick view. Visiting parks, botanical gardens, and landscaped areas can easily lead to mourning dove sightings. The mourning dove has many bird relatives around the world, and birders interested in learning more about this diverse bird family should first check out this stunning gallery of the world's most beautiful pigeons and doves. Just be sure to brush up on how to identify pigeons and doves in case similar species such as the Eurasian collared-dove, white-winged dove, or common ground-dove cause any confusion.